Let me tell you about a story about a girl who missed Scotland and never thought she’d find anything close in comparison to the food she had eaten there. Fish and chips were her favorite food in all of the world, but she never thought she would find anything close to the glory of the British Isles (and Ireland – duh). Then she stumbled upon this place: Macleod’s Scottish Pub. Can I just tell you: This place has the best fish and chips that I’ve ever had in the United States, and the only thing that comes even close is 4,000 miles away. I don’t know what the recipe is, and to be honest I don’t really care. If you have any self respect for fish and chips (and a bunch of o ther yummy British inspired dishes) make your way to this bar. The music, the vibe. We didn’t even know how to handle how great a time we had. The service was great, the food was amazing and I’m so happy to have found a nearby spot to help with those “homesick” days (aka every day that I just feel like I need buy a plane ticket to Europe). The best part? The price. My plate, steaming with chips (for you Americans, that means fries) and a giant burger filled with in-house tarter sauce and a hearty size piece of fried and battered line-caught cod. All this accompanied by a tall glass of the best Lemonade ever. Total cost? $15. Come. On. Wifi: Psh. You won’t even look/care. Notes: There is a Foosball table upstairs. If you’re not feeling up to a bar vibe, you can also experience a more diner-like experience next door. I went back, again, and tried the Shepards Pie. Another beautiful dish that honestly was the best version I’ve ever had. A must try! To bun or not to bun? That is the question. “What kind of bun would you like?” is more of the question. I was so glad to find this little shop this week, among my lunchtime shenanigans with my coworkers. At this shop I had, what has now OFFICIALLY been documented as the best hamburger of my life (even though the people at the front counter would like to add that it is like a hamburger, not a hamburger…it’s a hamburger) and I got a salad the size of Rhode Island. In addition (oh yeah, there’s more) I also ordered some delicious apricot soda, which was completely weird at first, and then my favorite thing ever. The location of this venue, while seeming a bit on the rough side, is worth pressing through to get to this delicious food. I’m no foodie – but I’ll be raving about it for years to come. Tip: Do your research to see if you would prefer a baked or a steamed roll! Life in Paris isn’t all crepes and picturesque walks along the Seine. But sometimes they are, and I think it’s fun to share with all of you darlings what one of the fun outing days of my life looks like! 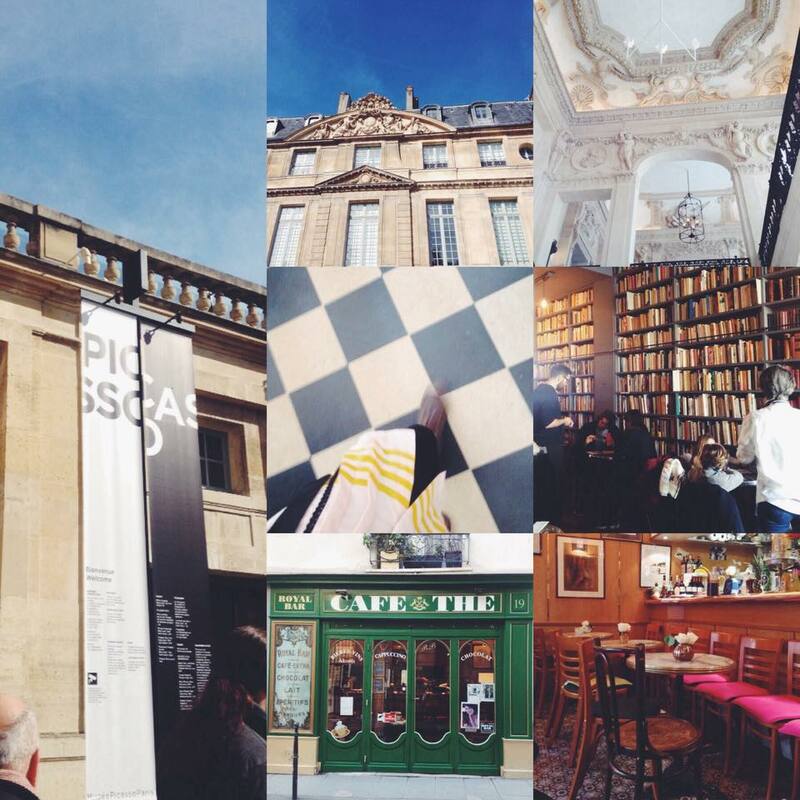 This time the feature was the Picasso Museum along with some other beautiful spots in Paris. We started off in the 3rd Arrondissement, which is the most “hipster” spot I’ve found in Paris (so far). There are lots of little shops, chic cafes and art shops and galleries. If you’re looking for a more low key artist vibe while in Paris this is the spot to head to. Our first stop (because rule #1 is never go to a museum hungry) was a sweet little cafe located near the Picasso Museum named Royal Bar. 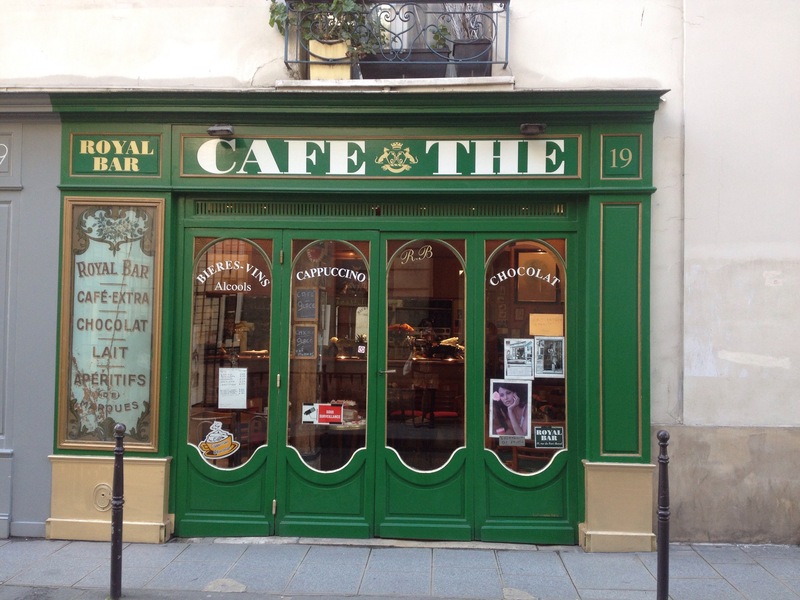 This little cafe was the quintessential Parisian experience. It was filled with art and made me feel like I had been transported back to the Paris of Hemingway. The tea was lovely (although, fair warning – when you order you’re ordering a pot, not a cup, so it’s a bit more expensive) and the man working there gave us some of the best lemon square type deserts I’ve ever had. It was sublime. After we had had some caffeine and some little desserts we headed over to see Picasso, because if you’re in Paris and don’t see Picasso what are you even doing with your life? It has kind of become ridiculous how many original pieces of classical art I’ve seen since living in Europe. It’s like my history books have jumped off of the pages, and it’s pretty incredible. Picasso hasn’t really been a favorite of mine, in the past, but I’m a strong believer that seeing work by “The Masters” makes an artist more rounded. The museum was such a beautiful building, I loved being able to see the amazing architecture and I fell in love with the floors. Yes, the floors. There’s something about black and white checkered floors that will get me every time. After we’d tipped our hats to Picasso, Cezanne and Matisse we headed over to walk along the shops surrounding. We found this absolutely beautiful shop called Papier Tigre. I loved the geometric feel of their designs and the minimalism. If I wasn’t a broke expat I would have bought the whole store. 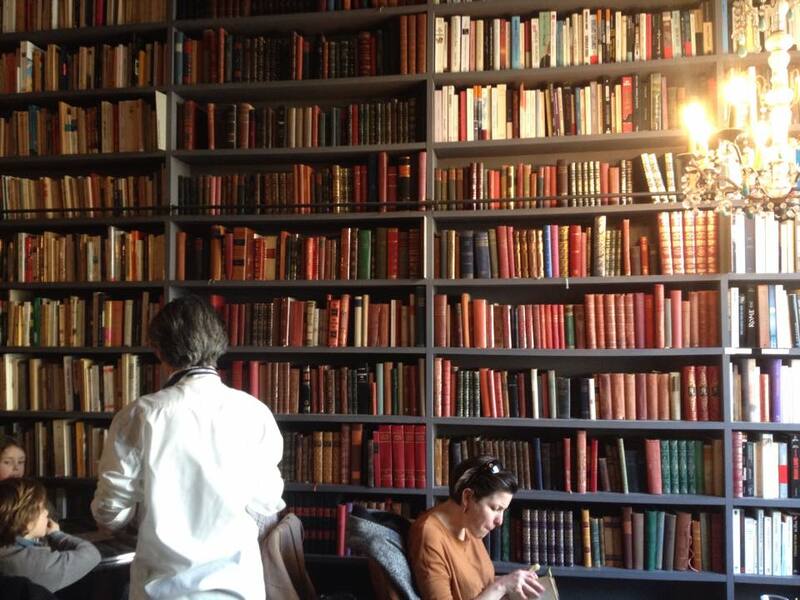 Our next stop was for some yummy drinks and the best wall decoration any place can have – books! This was actually our second time at this Merci cafe because the first time we went we made the mistake of going on a Saturday. In case you don’t know about Paris, some of the best advice I have for actually getting into places is to not go on Saturdays. Go any other day of the week, but Saturday is the “going out” day (while Sunday is more for staying in with family) in France. 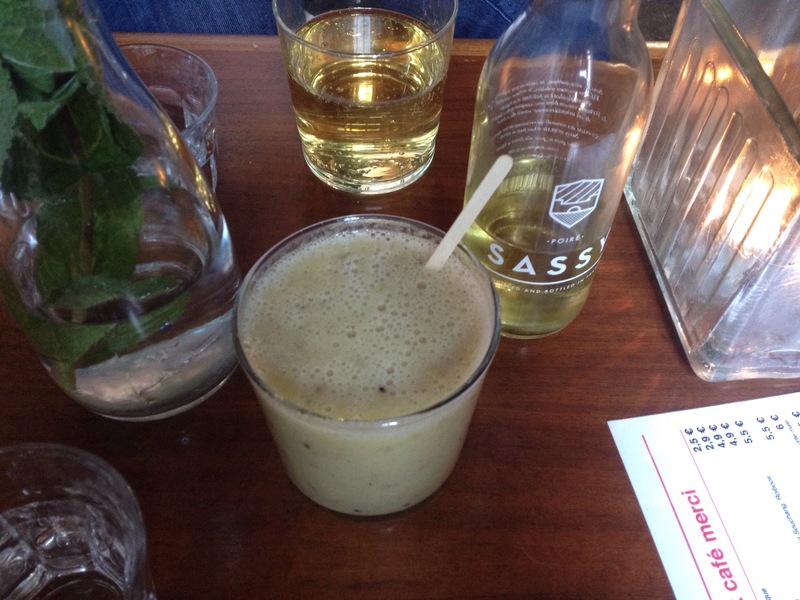 My partner in crime ordered a Pear flavored alcohol and I grabbed a banana, apple and kiwi smoothy which was just so good (even though it sounds awkward). It seemed fitting to end our day with a such a lovely cafe. Our day was so lovely and I love finding new spots that make me feel a little less like a stranger in Paris. This cafe is one of the most hipster cool experience you’ll find (Paris or otherwise) while begin a great cafe, it’s also filled wall to wall with used books. 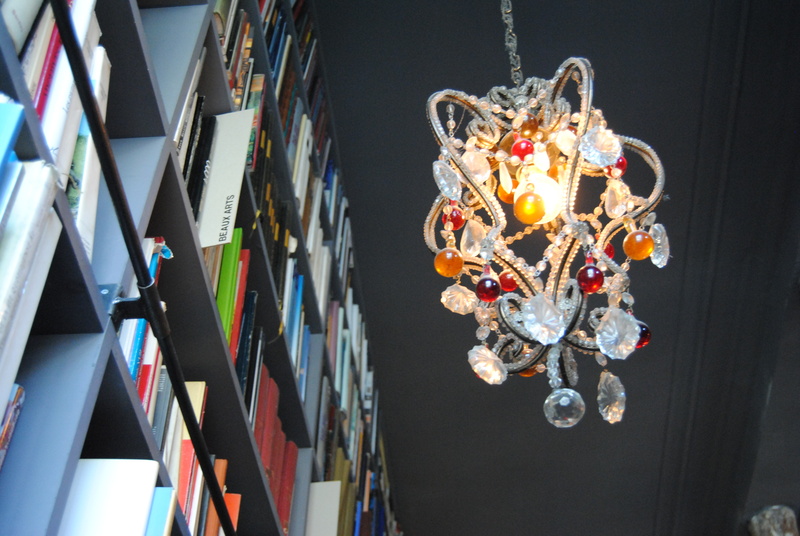 In addition to the antlers hanging on the walls, there are also vintage chandeliers that are just lovely. There is also a lovely store adjoining that has everything for your hipster needs ( no really, you’ll understand when you walk in). It took us a couple of times to get into this cafe because the first time we tried to go it was a Saturday – which was a mistake in the first place. In fact, I would advise staying away from such establishments on Saturdays in general. Saturdays are the French “go out-hang out” days, so you’ll probably find yourself packed in a place if you do. Sundays, in contrast are a great day to go out (especially early) because most French people stay in with their families on Sundays, or do things that don’t involve going out (unless it’s to a park or something). Overall the experience was great and our servers were just the nicest. Wifi: Unknown. I was enjoying myself so much that I forgot to check. This little darling cafe feels like you’ve passed back through time when you walk through the doors. While feeling like I should have been writing the next great American novel about the war torn past I never had, I enjoyed a pot of the most delightful tea and nibbled on lemon squares that were out of this world. 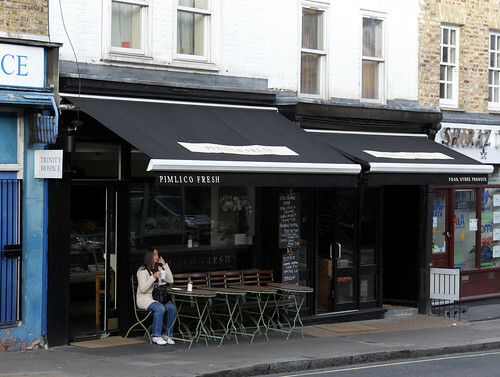 The space is small and intimate, so I can imagine it could get crowded quite easily during rush hours, but when we went it was just simply us, one older gentleman and the server – absolute bliss.